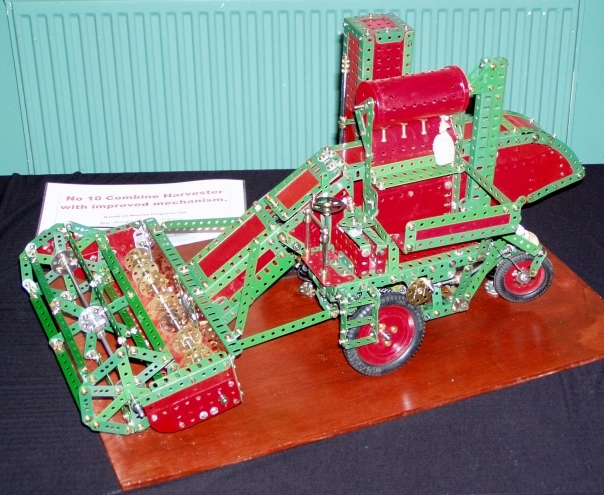 Our annual show was held for the second year at Tockington Village hall. The weather was beautiful and we all had a very enjoyable day. 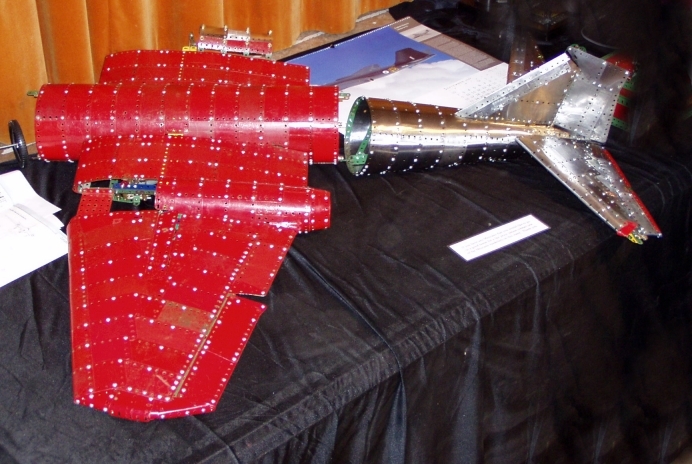 The hall was filled to capacity with models of all kinds, and we had a steady flow of visitors. 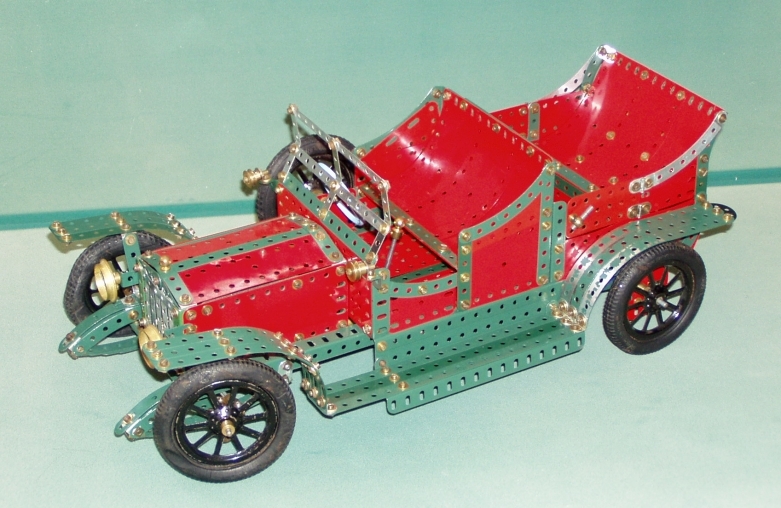 Pete Evans made a very large contribution (two cars full of models and sets). 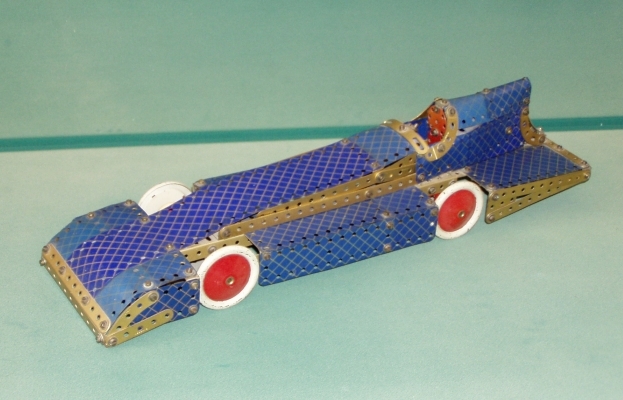 These included: SML Bagatelle, Weighing Scale and Meccanograph; several Aero and Car constructor models and an Aero set in box; Meccano sets: 1925 #5, 1930’s #6, 1950 #10 and a 1959 #10. 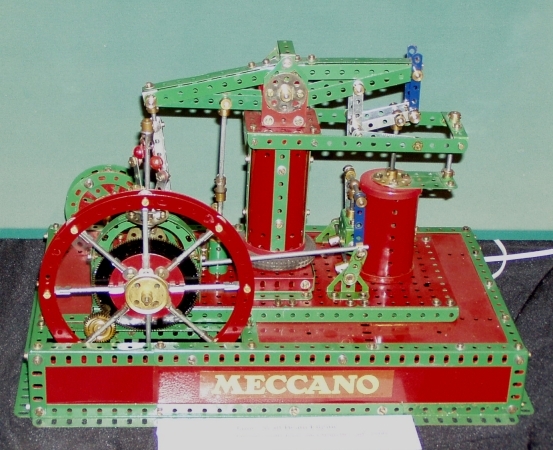 Models made by Pete included a Kietz oscillating engine and James Watt Beam engine. 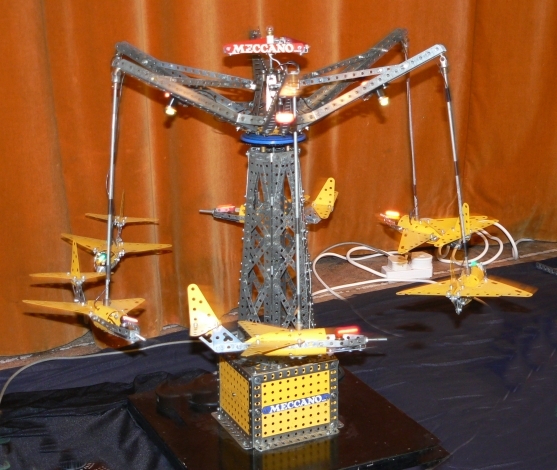 He brought a Meccano shop model of Flying Delta Jets. 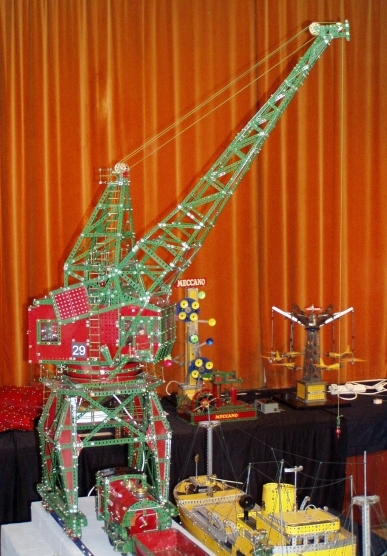 Best of all were his excellent Stothert and Pitt dockside crane model accompanied by the Peckit Loco and trucks, as seen on the Bristol harbourfront. 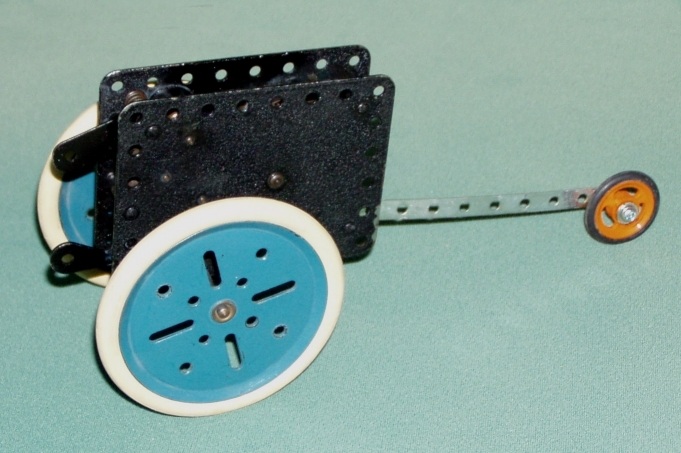 This clockwork tank engine will run on Hornby gauge O rails. John Day came all the way from Bridport with his White Knuckle Ride designed by Tony James. This model performed faultlessly all day. John also brought along a ‘model of the month’ Rolls-Royce car. 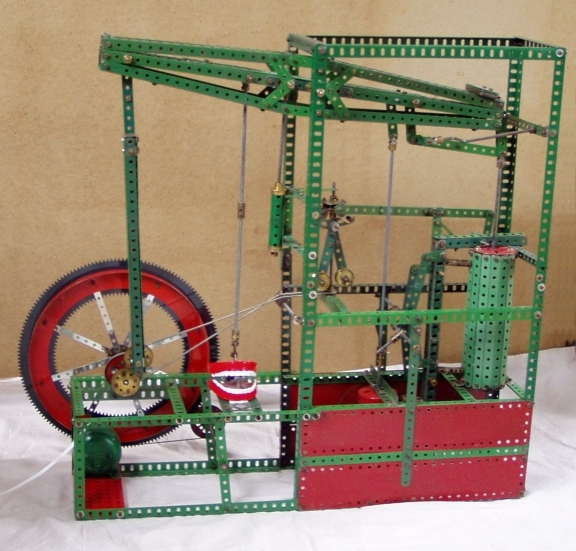 Phil Drew showed his ‘work in progress’ Clifton Rock Railway and two skill-testing Amusement Arcade games. 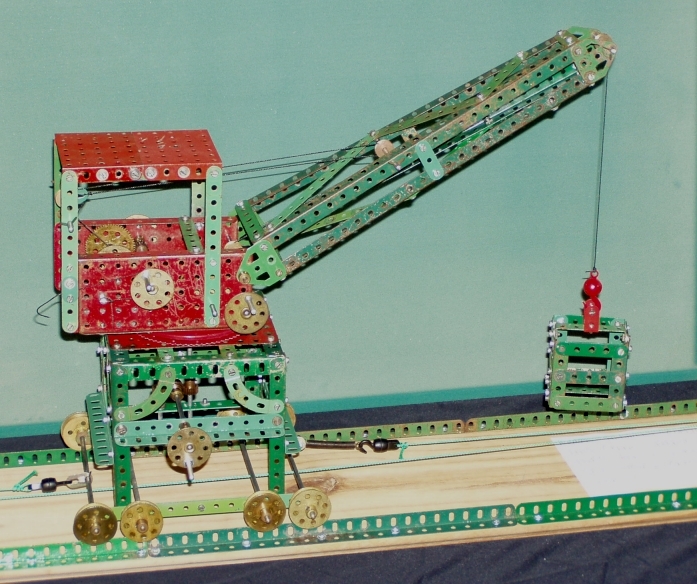 Andy Cope showed an excellent version of the Giant Block Setting Crane, a 10 set model leaflet Combine Harvester and a Bert Love designed Grandfather Clock with Moon Dial and Auto rewind capability. The clock started straight away and kept time through out the day. 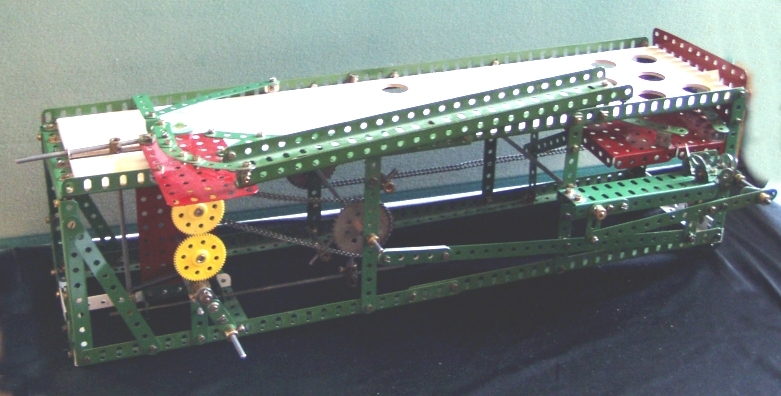 Sam Medworth showed his James Watt Beam Engine featuring Parallel Motion, a Condenser, a Centrifugal Governor and a Sun and Planet Gear crank drive. 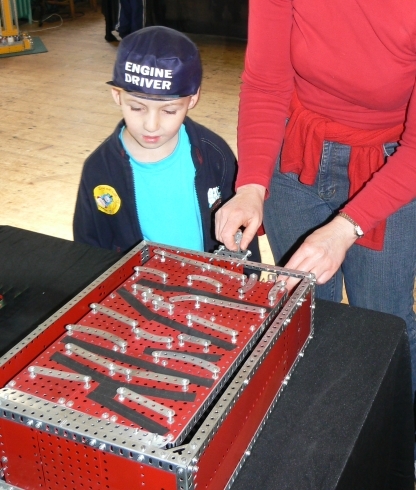 His Robotic Arm was also exercised by many of the visitors. 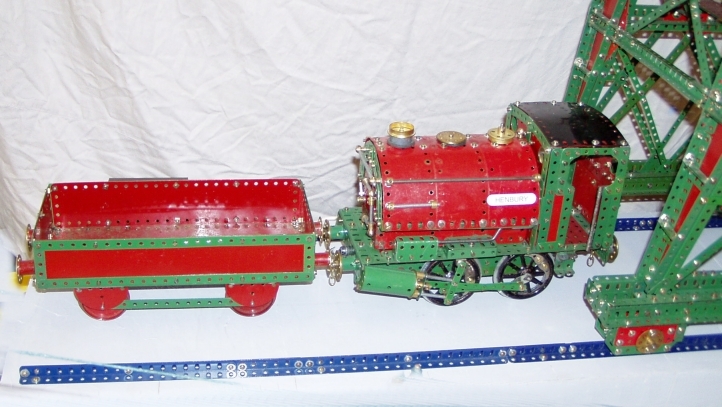 Ralph Clark demonstrated his mastery of Railway Locomotives with a Camel-Back (Mother Hubbard) locomotive from the Pennsylvania railroad in the USA. 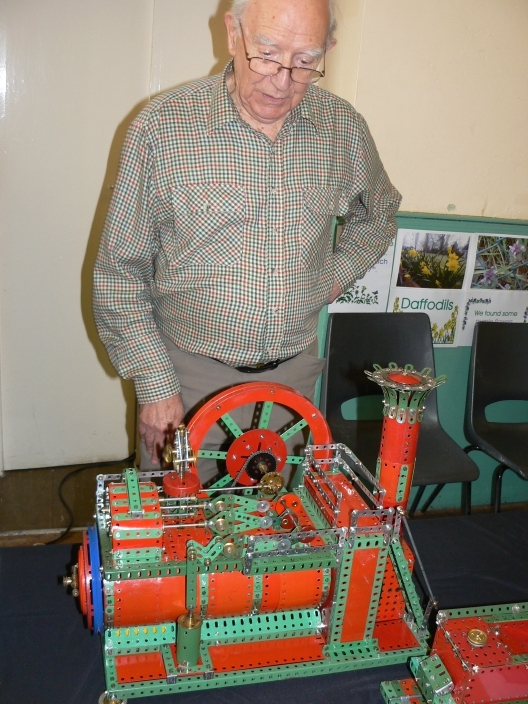 Ralph also showed a Stationary Steam engine (Konkoly design). 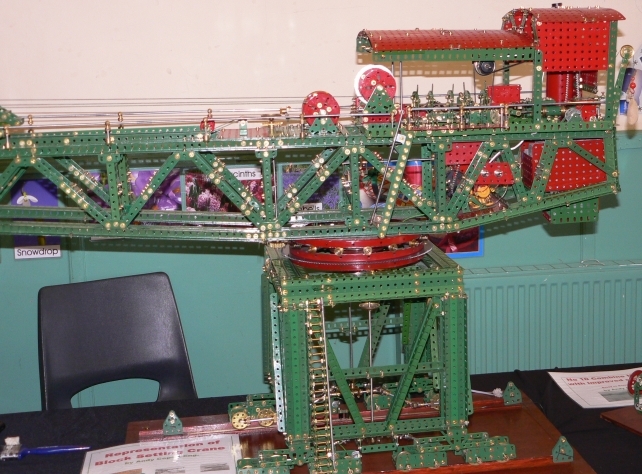 Neil Bedford brought a hands-on crane that the visiting children enjoyed. 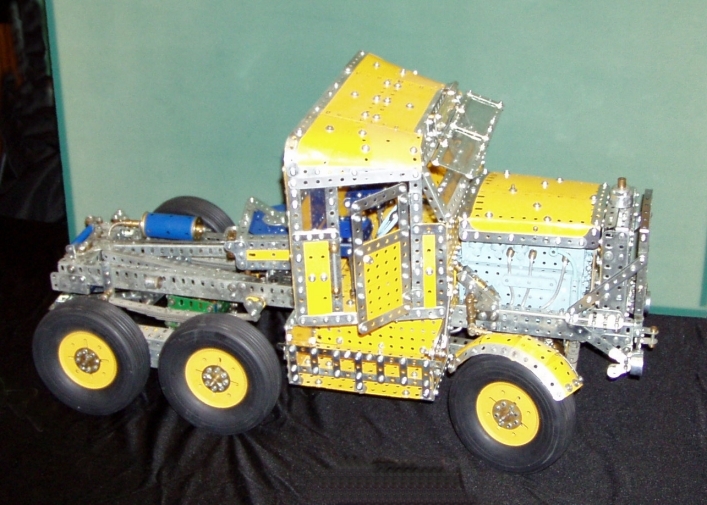 He has further improved his superb Scammell Explorer that is now powered by a 157 Watt Torpedo motor by MFA. 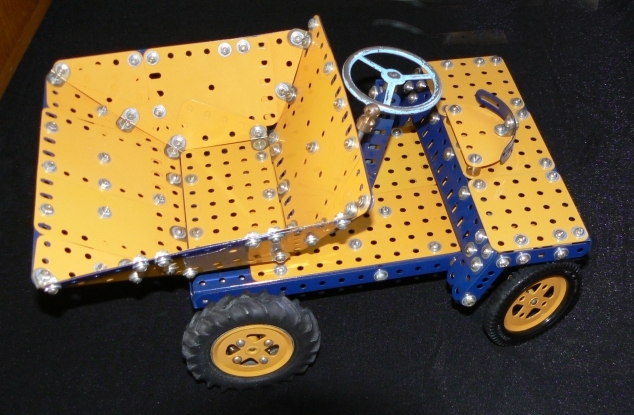 Other models were a Robot and three vehicles including his Landrover. His daughter Forrest contributed a Swing and a Monkey. Malcolm Hanson was unable to join us but made a significant contribution. 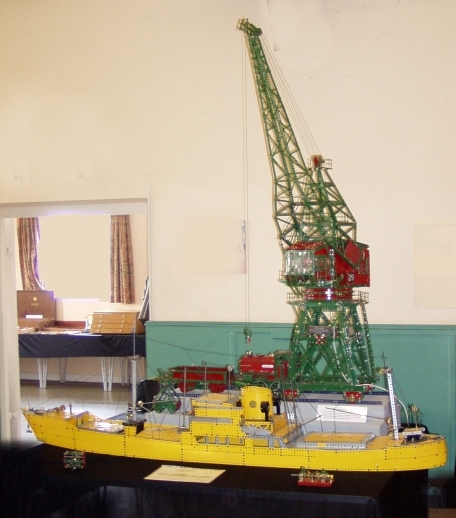 The largest was a #10 set model of the Cargo Ship that was shown in conjunction with Pete’s Crane. 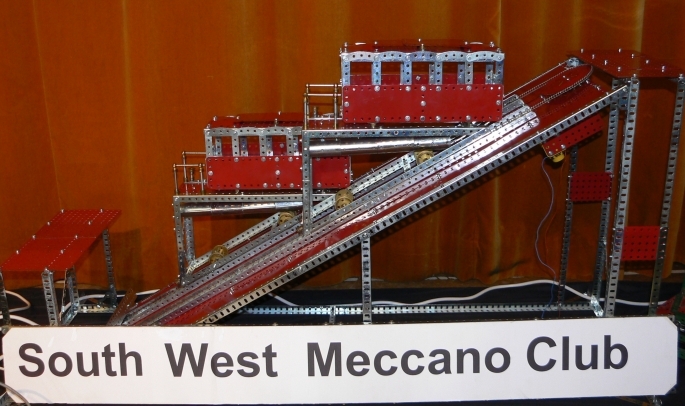 His Meccano Shop Display models were a Rocket Loco, Windmill and Ferris Wheel. 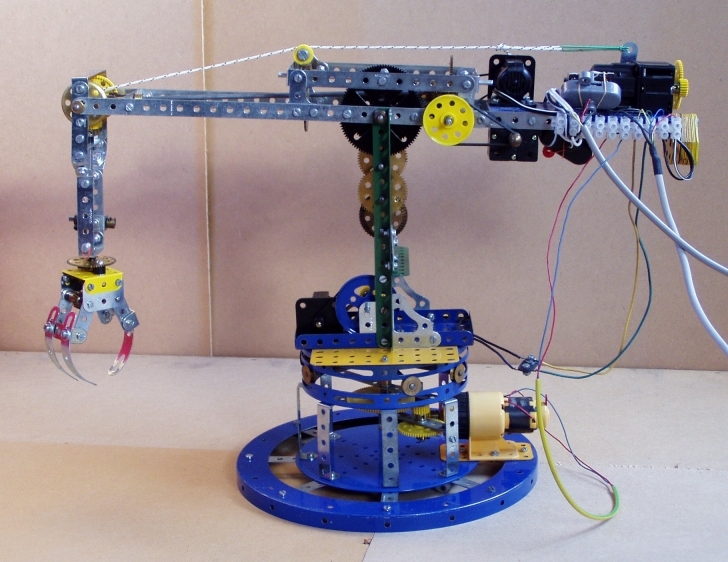 A model that the children loved was the Workshop with Pillar Drill, Saw (no cut fingers, phew..), Pump and Trip Hammer. I think this blue/gold Bluebird car was his. David Northcott was also unable to attend but kindly supplied his 4 foot long Barracuda made mostly from un-painted Meccano. David Worth showed a large number of mainly modern French models, which he had brought up on the train from Devon! 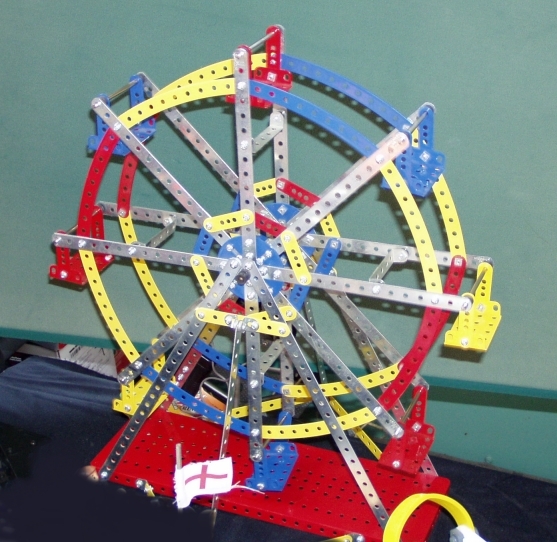 A good example is this Ferris wheel. 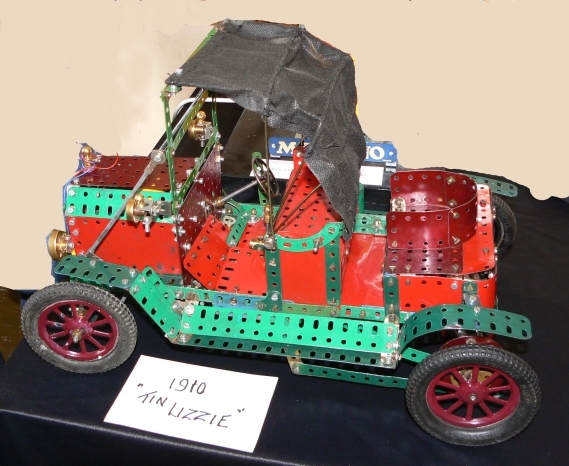 Brian Bowditch showed a 1910 Ford Tin Lizzie based on a Meccano Magazine design. Richard Smith showed his Winget Dumper Truck and the progress he is making on the English Electric Canberra bomber. 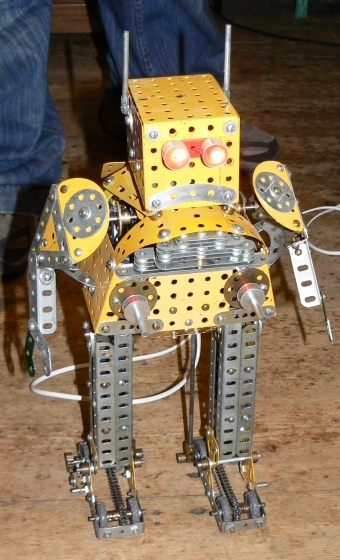 Sam was the winner of this year's scrapheap challenge; "a vehicle powered by a No.1 clockwork motor that will cover a floor distance of 20ft in the shortest time possible. Head-to-head races in pairs will be held on a knock-out basis. All the fun of drag racing!" His model shot straight out of the door of the hall and down the steps! Simplicity and lightness seemed to be the winning combination. Lastly, many thanks to Veronica Garside who very kindly spent the day catering to our gastronomic needs with her cakes and bacon rolls, and Lynn Smith for catering and collecting at the door. We made a profit of £40 that will be donated to the Jessie May Trust in Bristol.